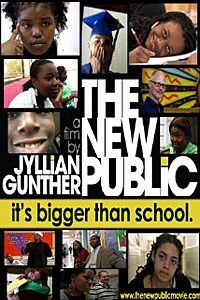 The New Public, Jyllian Gunther's remarkably engaging and complex documentary, tracks the experiences of students, parents, and staff at a new high school during its first four years. "I'm interested to see what the babies are about today," says humanities teacher Lavie Raven on his way to the first day of school. It's 2006 and he's on the sidewalk in Bed Stuy, headed to BCAM, a small public high school newly started with hopes of serving a population of students whose previous history includes a 40 percent graduation rate. BCAM, suggest the new teachers and staff, can do better. It's a theme school -- focused on arts and media -- and it means to deliver to the kids what they need, if only the teachers and staff can determine what that might be. This is the effort tracked by The New Public, Jyllian Gunther's remarkably engaging and complex documentary. Shot over four years, the film follows selected staff members and the first time principal James O'Brien, as well as several students as they make their way from freshman to senior year. O'Brien, a former DJ and basketball point guard, explains his initial ideas for the school in terms of his own past: "A good point guard knows how to make everyone around him better," he says, as the camera walks with him from his Brooklyn apartment to BCAM, "A good principal is the same way and I have those skills." O'Brien and his new team begin the first year brimming with optimism. Raven hopes to provide his students with material and a classroom experience that's "related to where they come from." English teacher Kevin Greer, whose previous experience is teaching at private schools, tells one student, John, that the difference between this school and his old school is that "We believe in relationships." John smiles, one of the students who plainly want to believe too, to see school as a safe, supportive environment. John, in fact, becomes one of the film's central subjects, as the camera goes home with him, observes him with his mother, whom he describes as "depressed." Skeptical of his enthusiasm and the school's promises, she appears removed and sometimes distracted. During one scene late in the film, as John tells the camera his beloved father has died, she's visible in the background, but silent and distant, if looming too. Other students' parents are more active, visiting with teachers and with James, worried as the school's mission appears to be losing focus. In observing the problems facing staff and students, the film is unusually frank about what goes wrong. Lateefah addresses tensions in class and on the street with an especially expressive vocabulary, her anger shaping her experience. Her mother Tawana and father Antoinne are at first impressed by the school's openness, then worried by it; the film shows Lateefah's reaction in a remarkable moment, as she's frustrated in class, takes to the hallway and drags a chair to lean against red lockers. The camera follows the chair, the sound scraping, and then slowly pans to her face, tear-streaked and -- in pain -- silent. Moses' mother Earlene comes to see James about her son's report card (he has a B, and that concerns her, as he's been an "energizer bunny" as a child, walking and talking early, always steps ahead of peers), and responds as you might expect to the news that James has called Moses a "knucklehead." The camera pans from one face to another as they parse the meaning of the word, how it might apply to a person or to behaviors, agreeing at last that Moses does need to focus more on his schoolwork, less on his extracurricular associations. That BCAM's counselors and teachers must takes into account what students encounter at home and "in the street" is at once expected and difficult, as these influences, no matter the parents' hard work or lack of same, are pervasive. As Earlene and her ex-husband Moses (their son is III) try to intervene, they also make suggestions to his teachers, and vice versa. The New Public leave space for what you can't see, what the kids endure themselves and what the teachers might want to experience. You see Moses goofy with friends or acting out with his mom (they share a partly entertaining, partly worrying discussion of whether he can chew gum in school: "It has nothing to do with your teachers," Earlene says, her eyes focused on the road as she's driving, even as her voice carries throughout the vehicle and frame space. "It's how you were raised." Her concern is echoed by teachers, like Lavie and Kevin, who worry that the school, in trying to be too "friendly" to students, has not provided enough structure or discipline. James tries to balance structure with freedom, sorting out priorities, reasoning that no school can be perfect its first year, and also, acknowledging that forces exist outside of school, economic, political and always emotional forces that might be met but must also be understood, not just condemned. This is the great generosity and intelligence that the BCAM staff and students and parents all come to share, as they forgive mistakes and find ways to contend with these forces.